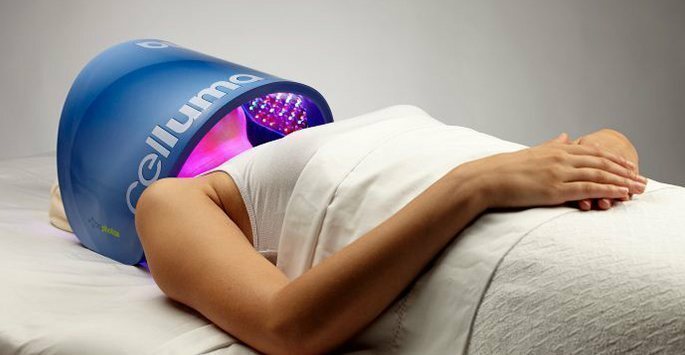 The Celluma, is a 3-in-1, LED light-energy device widely used by estheticians, dermatologists, plastic surgeons and other wellness professionals to treat a variety of skin and musculoskeletal conditions. Cost-effective, portable and scientifically proven, Celluma is unlike any other professional LED device available today. Light energy is emitted from the Celluma’s shape-taking light array panel, and absorbed at the surface of the skin to re-establish cellular health, and up-regulate cellular function. A patented delivery system emits three specific wavelengths of modulated (pulsed) light controlled by proprietary software algorithms. All three wavelengths work synergistically in each of the Celluma’s programs to optimally address specific conditions. The benefit of using three wavelengths is that light-absorbing molecules respond to different wavelengths of light energy, resulting in a targeted increase in cellular activity. For example, some reduce inflammation and some kill bacteria, while others enhance localized circulation. There are several key considerations when designing an efficacious phototherapy device. These include proven therapeutic wavelengths, pulsed delivery of the light energy, effective power emission and the ability to emit energy in very close proximity to the tissue. Celluma meets all these requirements. It is a polychromatic device that delivers blue (465 nm), red (640) and infrared (880) light energy simultaneously to safely treat a wide variety of conditions easily and affordably, both in a professional setting and at home. Its unique flexible design and large light panel (over 15” x 8”), molds closely to the body and therefore facilitating effective energy absorption by tissue. In addition, the Celluma’s portable, affordable, lightweight design permits easy and frequent use, and does not require monitoring during the treatment session. Based on scientific research pioneered by NASA, the Celluma is a specialized light energy device FDA cleared to treat: inflammatory acne vulgaris, diminished local blood circulation, muscle and joint stiffness, muscle tissue tension, muscle and joint pain, muscle spasms and arthritis. The Celluma has two additional pending indications: the reduction of facial wrinkles and the reduction of facial skin spots. These clearances are expected shortly. Am I a Candidate for Dysport Injections?